Whenever we train a new employee at 3Gstore, one of the first things we teach them is that our primary goal is NOT to "make a sale," it's to sell the customer the RIGHT products - or don't sell them anything at all. This often surprises new employees, especially if they come from a more traditional retail background where sell-sell-sell is the motto. Our philosophy is definitely different, but in our opinion it makes a lot more sense. By investing some time with the customer to determine what their needs are and what they're trying to accomplish, we can make a more accurate assessment of which products will help them. This customer service strategy helps ensure that customers don't have to deal with the disappointment of something not working the way they had hoped or the hassle and wasted expense of buying something that isn't appropriate for their needs or is incompatible with their existing equipment. Pre-sales support: our experienced staff is available via phone, online chat, and email and can answer virtually any question about our equipment, how it will work with your existing gear, what you can expect from it, etc. It sounds like a no-brainer, but a lot of retailers aren't actually all that well-versed in the equipment they sell or the technology surrounding it (just try to ask a Verizon rep about using a router with one of their mobile broadband modems - yikes!). Customers are often surprised by our level of knowledge - I think I hear some variation of "wow, you really know what you're talking about!" just about every day! Online resources: no one wants to waste money on something that isn't going to work for them, and the best way to avoid that is to do some quick homework before buying. We provide lots of helpful tools for customers to use before making a purchase. If you're thinking about signing up for Verizon 4G service, for example, it's a good idea to check the coverage maps first so you can get an idea of whether the coverage is going to be good where you need the service. If you're considering buying an antenna or amplifier to boost your signal, we recommend doing some testing at the location so you can make sure the antenna/amplifier is actually going to improve your signal and performance. 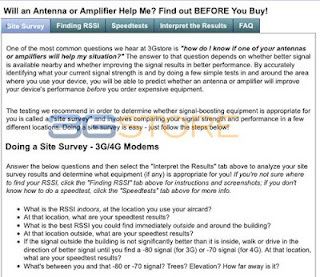 Customers looking for a router for their 3G or 4G device should check the compatibility charts so they can make sure their device is compatible with the router they're interested in; we also have a router advisor tool that allows you to narrow your search based on certain features you need. Just say no: sometimes, we don't have anything that will help a customer. In these instances, we are always honest with the customer - we would much rather not make a sale than have a customer buy an antenna when it's not going to help their internet speeds, or have to return a router because it didn't have the feature they wanted. If the problem is that the customer's expectations are simply not realistic (for example, customers hoping to acquire 4G signal from a tower 40 miles away), we'll explain why; if something exists that would be suitable but we don't carry it, we'll make a recommendation if we can. While it may seem strange compared to other stores, our sales philosophy is one of the many things customers love about 3Gstore. When you shop with us, you can be confident that we will never recommend something just to make a sale - we're concerned with making the RIGHT sales, not just making ANY sale. International Travel: Pay for Plan or Free WiFi? Using a SmartPhone for site surveys! Nokia Releases 808 Pureview in the U.S.
What Data Plan is Right For You? Data Plans Part 1: What do they do? AT&T Data Only Wireless Plans? IPv6 Transition, are you ready?